What kind of strat is this? Discussion in 'Guitars in General' started by Markorock37, Feb 20, 2012. Picked up this strat on the cheap, seems to be built pretty well. 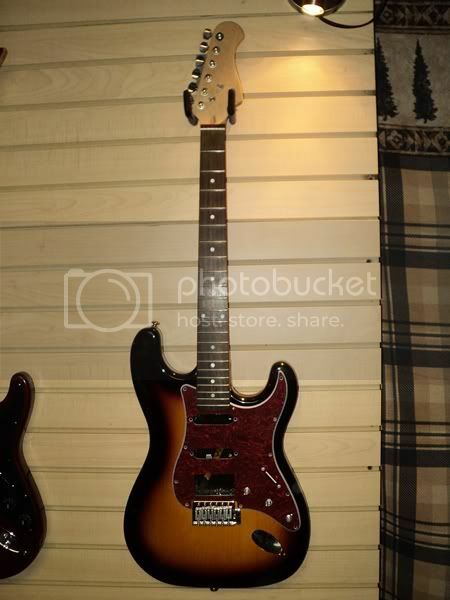 I can't find this headstock shape anywhere. The guitar has a Dean neck plate, no serial #. I'd like to get a logo back on it when I figure out what it is. It may be a parts guitar. 22 frets on the OP's. Sort've looks like a Hamer Daytona, without a logo of course. But they had pearl inlays, on USA models. Those look white from the pic. Also no trees. Could be an import. What kind of trem? Could be anything really. A hodge podge of stuff. Hopefully didn't pay too much. I put American stainless saddles on the bridge FYI. I intially thought it was a Stagg too, but couldn't find a 22 fret model there either. Plus the headstock has an ever so slight curve before it gets to the round end. I would say its more like an SX headstock. The 22 frets throws me off as well.